Second, aren’t we just so insanely blessed to be able to openly celebrate this day without putting our life in danger? My mind has been consumed with thoughts about the Kenya university massacre and it has made me realize how often I take this blessing for granted. One of the things that annoy me about fellow Christians is being so unnecessarily and so excessively vocal about their faith. Because I grew up in a conservative Christian family, there were many times during my childhood when I felt like Jesus was being shoved down my throat as well as other people’s throats, and I hated it. 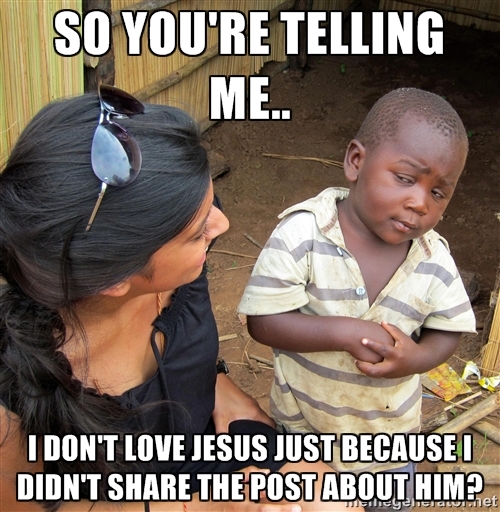 Even now, I roll my eyes whenever I see “If you love Jesus, like and share!” posts on Facebook and Instagram. The last thing I feel is surprise whenever I see people who aren’t Christians get put off by Christians because they’re too outspoken to the point of being condescending. And because of that, I’ve always been very reserved when it comes to my faith. I can always write about it, but talking about it with other people face to face has always been very challenging for me. Whenever my friends would confide in me about their problems, the last thing I’d feel comfortable telling them is to pray about it. I would sometimes get very conscious when I’m out with friends and I’d close my eyes to pray before eating. Sometimes, when everyone’s already in the middle of a fun conversation, I would opt to not pray anymore so that it wouldn’t “spoil” the mood. My friends aren’t even the kind of people who would judge a person for their religious practices but I felt the need to downplay my faith all the same. And now I feel so incredibly ashamed for all these things. How ungrateful and stupid am I to let petty things like public image unsettle my confidence and pride in my faith when there are thousands of people across the world whose lives are literally at risk just because they believe in something other people are against? How foolish am I to fear putting off someone for displaying my faith when there are other people putting their life on the line for believing in theirs? I’ve learned today that openly practicing my faith doesn’t and shouldn’t automatically mean I’m shoving it in everyone’s face. I’ve learned that showing my faith with neither fear nor risk is a blessing that not everyone has and, therefore, should be appreciated and taken advantage of. Most of all, I’ve learned that I have such a long, long way to go in terms of my walk with Christ. I am so incredibly fortunate that I have a God who believes I am worth it, that I have accepted into my heart the One who believes I am worth dying on the cross for… even when I know I am not.